It’s important that you monitor your older dog’s weight. Excessive weight puts undue stress on a dog’s heart, skeleton and other vital organs. 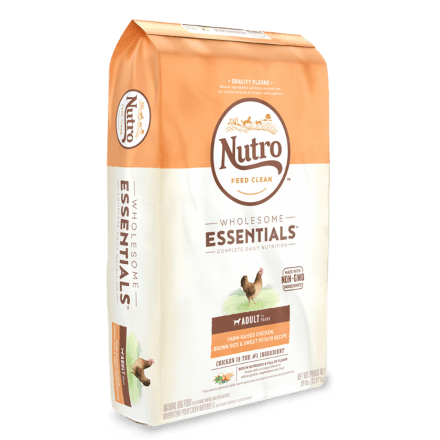 If your dog is being fed according to the feeding guidelines and still exceeds the recommended weight, switch to a NUTRO™ Lite Dog Food to reduce calorie intake until your dog reaches the ideal body condition. Then, switch back to a senior dog food. And remember: No table scraps! Once your dog becomes a senior, even if they still look young, it’s important to adjust your dog’s diet to a natural senior dog food, such as a NUTRO™ Senior Dog Food, to maximize overall health and well-being. If your dog ever has trouble chewing, report it to your vet. It could be an abscessed tooth or diseased gums. Regardless of the cause, you can mix dry food with a bit of warm water to make it softer and easier to chew, or feed a wet dog food. As dogs become seniors, oftentimes their desire to eat declines. By mixing wet dog food with dry kibble you can help encourage your senior dog to eat.